Dedicated to famed cowboy artist’s work, you can find the most complete collection of CM Russell art and memorabilia in the world in Great Falls. The CM Russell Museum draws visitors and acclaim world-wide. 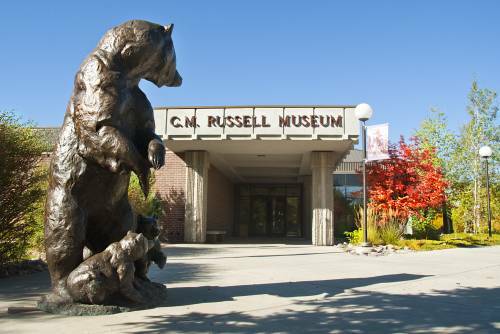 Voted Montana’s best museum worth traveling for, the museum has over 2,000 Russell works of art and artifacts in its permanent collection, as well as an impressive Browning firearms collection and artworks of OC Seltzer, Gary Schildt, and other Western artists. Next to the museum is Russell’s log art studio, built of red cedar poles in 1903. Walk inside and experience a time when the West was young, and Charlie’s paints and easel sat waiting for his touch. The Russell home underwent an extensive renovation and re-opened to acclaim. Built in 1900 for $800, Nancy Russell supervised its construction and decorated the home with the best furnishings of the day.